Postcard US-3841697 to Germany shows a January, 2003 photo at Santa Monica beach near Los Angeles, CA when I was visiting from Florida. 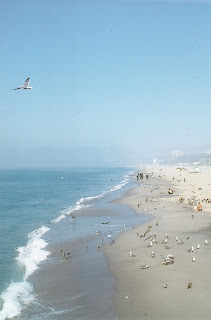 The picture was taken on the 100-year-old Santa Monica Pier, looking north. It was fascinating to see beaches on the Pacific Ocean side. It was before the US-led Iraq invasion in May, 2003. I had just watched the debates about starting the invasion on TV in my hotel room before taking a walk on the pier. In less a month, then US Secretary of State Colin Powell would go to the United Nations Security Council to present his now infamous speech loaded with flaws on February 5, 2003. I can't help but wonder what if we could turn back time and change the course of history? Without the war, we would be in a much better world today.